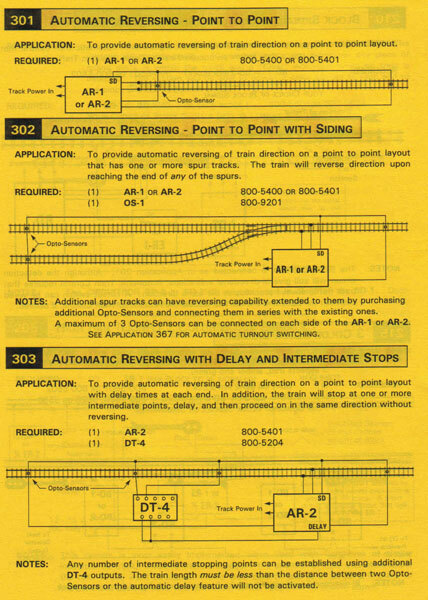 Do you have the auto-reversing track set, or is it just the trolley shown in that set? Since you already have track, you just need a speed controller. The trolley that comes with the auto-reversing set is like any other locomotive, the track in that set has additional wiring built-in to reverse polarity and detect when the trolley/train reaches the end of the line. If you just have the trolley and regular track, you could use a Circuitron AR-2 and a couple of their Opto-Sensors to set up a back-and-forth operation with delayed stops at each end. Actually, you can set it up for stops in the middle if you wanted to. I ONLY HAVE TROLLEY, THE TRACK I HAVE IS REGULAR NOT THE AUTO REVERSE TRACK. ALSO IF I USE AN AR-2 THAT WONT WORK BOTH DAY AND NIGHT DUE TO THE OPTIC SENSORS CORRECT ? The sensitivity for responding to the opto-sensors is adjustable on the AR-2, so they'll work with some fairly dim light. But there has to be some light available, even it it's a "street light", or "yard light", located near the sensor. There is another train shuttle by tamvalley. It's DCC and it uses rail gaps to detect train location, and can be used to control end and mid stops and also will activate turnouts. I just saw this quote below and wanted to comment. The auto-reverse track does have extra connections, but the speed controller is what actually has the direction control, so you can't just use any controller. You CAN use any ez-track, but you need to do a little wiring to make it work with the auto-reversing transformer. I experimented with this last year before I switched over to DCC. I used only the end sections of the auto-reversing track, and used regular ez-track for all other track. All you have to do is run a wire from the beginning section of track over to the end section so it can provide the feedback to the controller, and then every other peice of track inbetween can just be regular ez-track. Tom - I've done that before too with the extra wires. The good thing in doing it that way is you can use different radius curves instead of having to stay with 18" radius.